Hip safari style vests are everywhere right now. They're perfect for adding a stylish layer to a summer outfit without bringing on the sweat. This sleeveless trench coat was a steal at Forever 21. However, they didn't have any in my size. It was so irresistible that I bought it anyway and created an extra loop with the belt in the back to make it fit. When something is affordable but not in your size there can be ways to make it work. LOve this outfit! YOu look gorgeous and your clutch is wonderful! Your leo clutch is great! Love it! Love how nature-y this looks!! That clutch is absolutely incredible - I need it in my life! you are always put together so nicely! so cute and effortless! Such a great simple outfit.. well done! I like how you customized the vest to make it work for you. I also love the folded clutch and was wondering what is the name of your nail polish? Adorable sleeveless trench! Great job making it work...can't even tell it's not your size! I've loved the sleeveless trench for a while but they don't seem to like them here:( It looks fabulous on you:) Hope you had a great weekend! I bought a sleveless trench in the winter and i'm so so glad I did, I never stop wearing it. Love this one though. Such a good idea, when a girls gotta have it, she's gotta have it. fabulous outfit girl :) love that clutch! What don't I love about this outfit? NOTHING! You look stunning!!!!! !Perfect summer outfit! 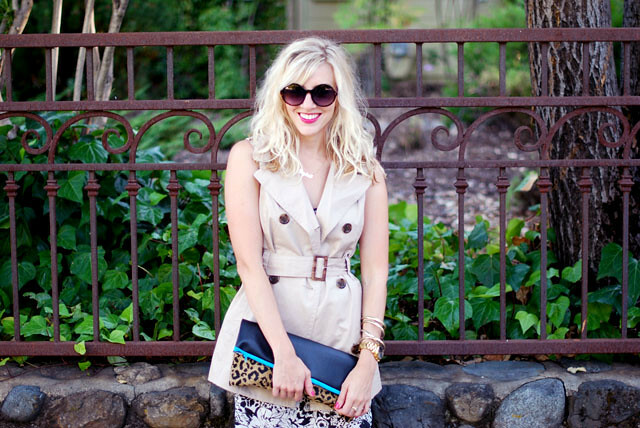 The mixture of patterns is so cute, and the trench is a pretty steal of a deal! That clutch is amazing, I love the aqua/turquoise accent on it! I love your DIY fix. Looks lovely on you! And I'm completely, 100% obsessed with your clutch! the more i see this trench the more i want it!! I love the safari vest and your gorgeous wavy hair! Great look and awesome find with the trench vest! It looks a lot more expensive than it is. I love your clutch and those ADORABLE sandals! Awesome accessories! That clutch is so great. I agree, and have been searching for a safari style vest myself! I'm glad you were able to make that one work! I almost bought that same sleeveless trench at F21 the other day! I'm kicking myself for not grabbing it up! Wow another great Forever 21 find! You rock every outfit! Your lipstick has been inspiring me a lot lately :-) thanks for freshening up my look! love those curly in the city clutches. so cute and versatile! love your clutch, nail polish, and hair!! I love your new blog layout so much! Gorgeous! And that vest is yummy! That bag is so cute, and your nail polish is to die for! What shade of nail polish are you wearing? It's absolutely fab! Love it!